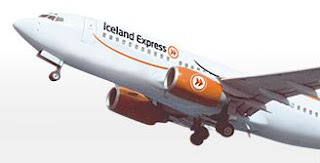 In a remarkably successful attempt to divert some of the media spotlight away from Belfast City Airport this morning, rival Belfast International pushed out news that Iceland Express will be launching a direct* twice weekly service to Reykjavik on Mondays and Fridays from 10 June 2011. "As a committed and integral supporter of NI plc, our priority is to invest in the provision of new and vital direct access channels from key source markets. The aim should always be to develop the market, not simply splinter or replicate services to the detriment of the local economy. We are not in the business of simply re-arranging the existing business in the market with the aim of satisfying some short term objectives. We continue to strive to have the broad regional objectives of our business recognised and supported by Northern Ireland's policy-makers." So the other local airline news. Last night, I posted about obvious oddities with bmibaby’s website, showing Belfast City Airport offering more than just bmi’s route to London Heathrow. It turns out that bmibaby are putting all their toys back into their pram and wheeling them down the M2 to Belfast City Airport in January. The last bmibaby flight will leave Belfast International on 9 January, with operations restarting at the harbour airport from the morning of 10 January. Destinations will continue to be Manchester, Birmingham, Cardiff and East Midlands Airport. Update 1 - Notable that the BBC news page that earlier just covered the International/Reykjavik announcement now relegates that to the last paragraph and concentrates on the City/bmibaby move. The news cycle has caught up. UTV have merged the two stories together now, with bmibaby trumping Iceland Express. Update 2 - It's a direct flight from Reykjavik to Belfast International, but as James points out, the return leg is via Edinburgh. Iceland Express fly triangular routes. Slight correction: Iceland Express will launch a direct twice weekly service *from* Reykjavik. On the way there, it'll go via Edinburgh to pick up more passengers. Icelandair have a very similar and successful triangle route from Reykjavik to Manchester, then via Glasgow back to Reykjavik. Of special interest will be the possible new connections to Boston and JFK, and the recent announcement that Iceland Express will be renting loaded iPads as in flight entertainment devices. Not sure about the other news, however. BE and WW aren't going to come out of this without some blood being shed. This will be the first time two airlines have competed airport to airport, rather than just city to city, from Belfast in a long time. All mums can now literally go to Iceland from Northern Ireland with a new direct route beginning in June next year. I'll need to get a flight to Edinburgh next week to collect a new car - probably first flight at 8.30 or so.